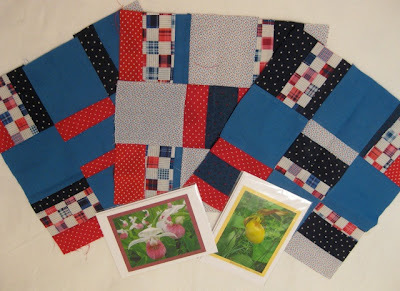 Love from the Heartland is a Disappearing Nine-Patch quilt, made with the three blocks that FarSide contributed and the fabric scraps that gMarie sent with her blocks for the 12 in 2012 challenge. I added a few of my own scraps to FarSide's blocks and gMarie's scraps to make this a completely scrappy quilt. 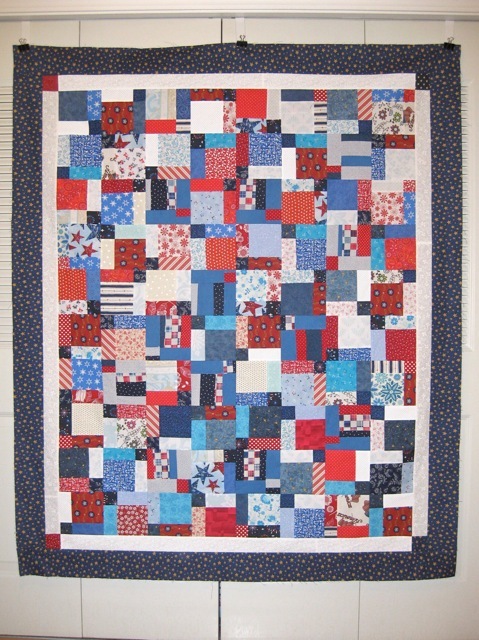 Love from the Heartland is the twelfth quilt in the 12 in 2012 Quilt of Valor challenge; however, my bin of red, white, blue fabric is not empty, so I will continue to make more Quilts of Valor. 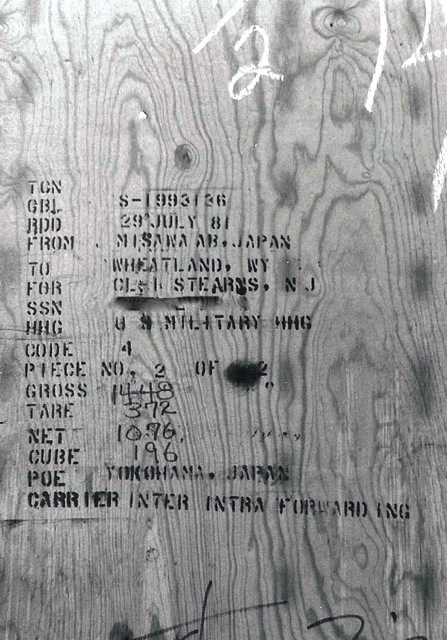 and across the Pacific Ocean on a slow boat. I can't remember when the last train came through town, but I do remember traffic stopping for the train to cross Main Street when I was a child. 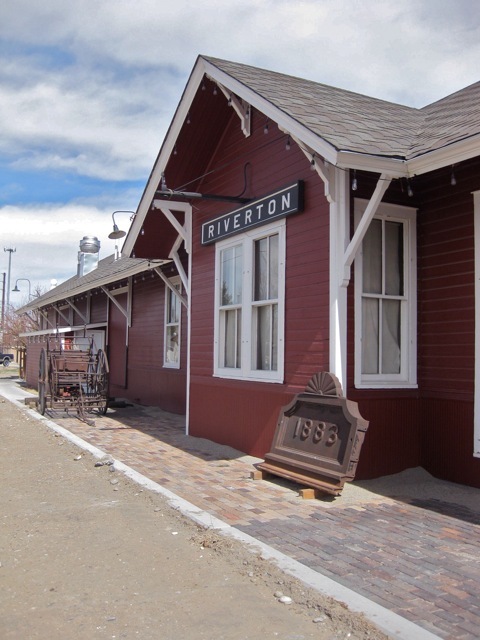 The tracks have long since been pulled up, and the right of way through town has been turned into a paved walking trail, which some civic organizations have adopted, planting trees, grass, and flowers as well as placing benches for respite. Over the years the depot has housed various businesses - the Chamber of Commerce, a gun shop, and a restaurant. This historic building is now a popular Mexican restaurant, called The Depot. 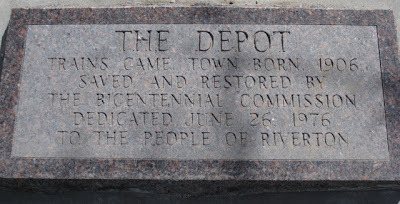 Several years ago, the building's foundation was repaired, and the area surrounding the depot is currently being transformed into a mini park where visitors can stop and admire this lovely old building that continues to be a vital part of the community. This video explains perfectly why I have committed to make 12 Quilts of Valor in 2012. If you would like to read how the quilts impact those who receive them, read this post on Alycia's blog. 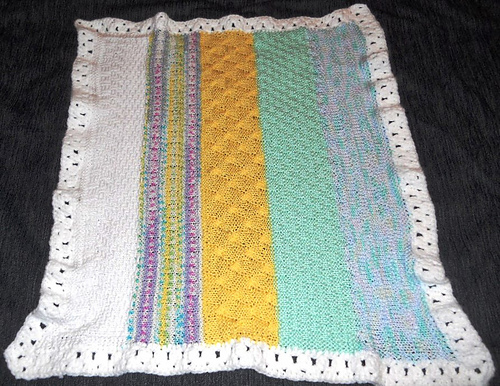 I promised another Oddball Baby Blanket update featuring the completed blankets. Sorry it has taken me so long to actually do it. 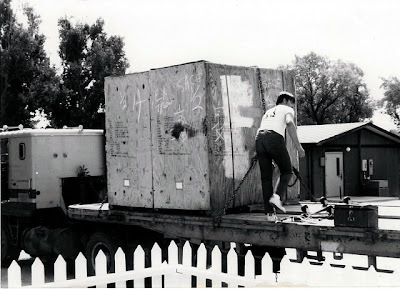 Click the links below the photos to see the original posts. 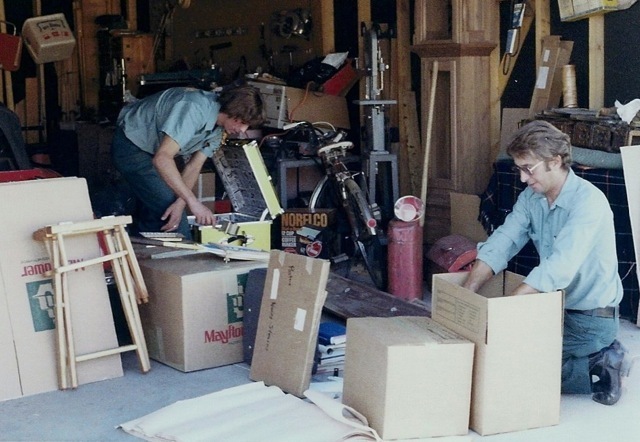 The things I took would easily have only filled a quarter of a pick-up truck bed. 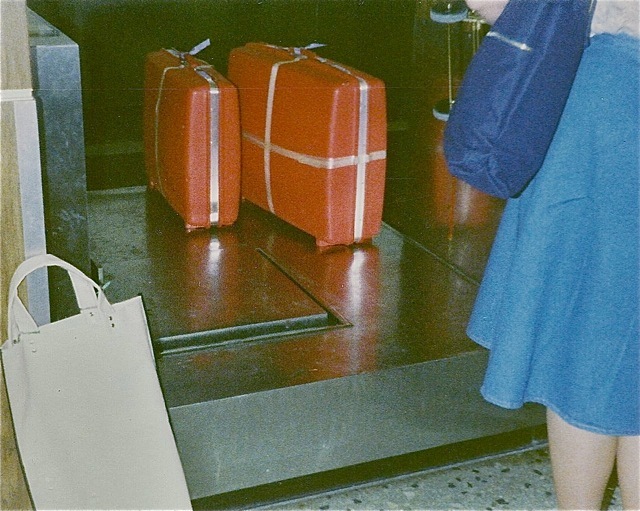 to reach Japan, I had to take clothing for that period of time with me. 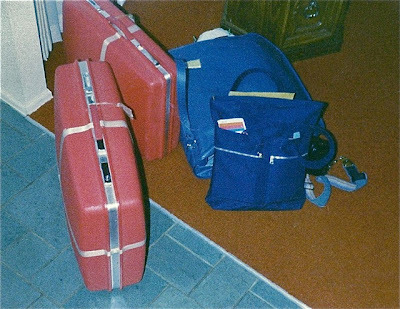 my camera, a purse, and a carry-on. I had to carry my luggage to the bus terminal and catch the bus to Travis AFB. an escalator in San Francisco's airport. It was not something I want to repeat. Come back next week to see what I brought home two years later. All Orenburg shawls have borders, so that was one of the exercises on Saturday's workshop. 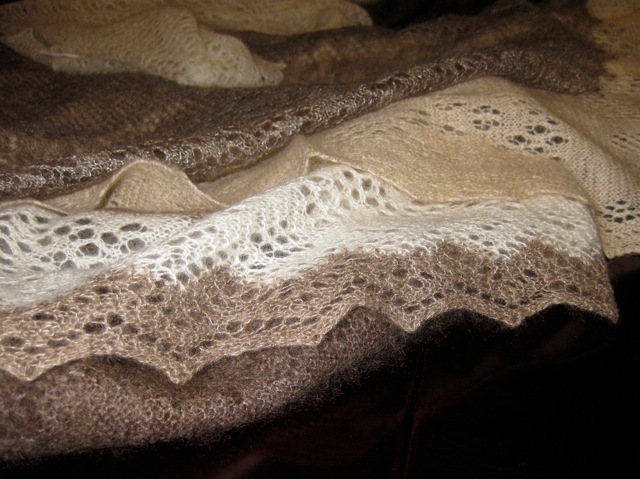 Orenburg shawls are knit strictly with garter stitch, yarn overs, and knit 2 or 3 together - no purl stitches. 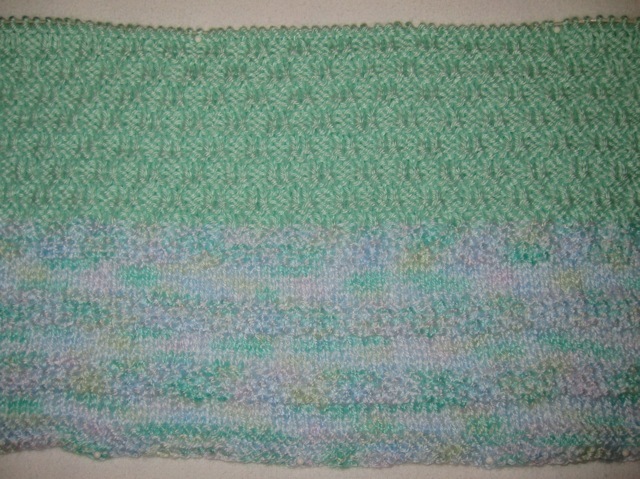 I've knit many items over the years but consistently avoided any patterns that involved charts. 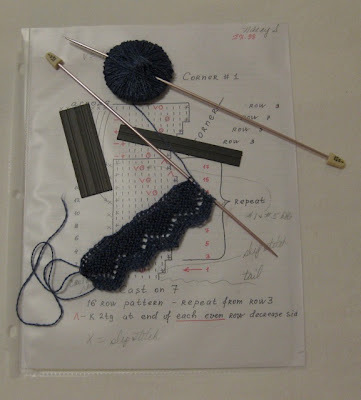 Saturday, I managed to knit my border swatch, as well as some sample lace patterns, using charts. The learning curve wasn't too steep for this section of the workshop: the frustrating part was yet to come. 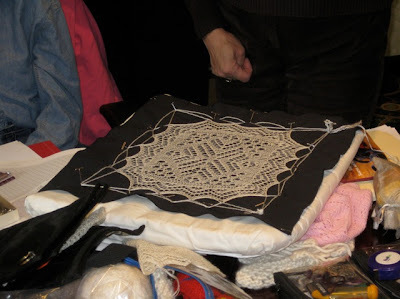 Lace points are adjusted during the blocking demonstration. 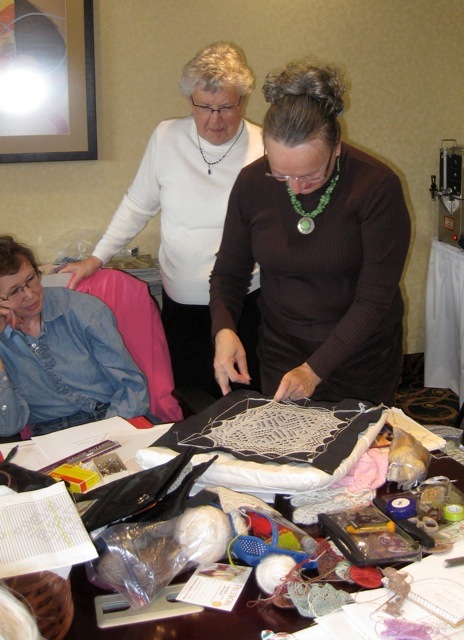 At Sunday's workshop, Galina demonstrated a wonderful lace blocking technique. She told us to use nylon cording because a wet shawl will not stick to the cord; thus, it can be positioned easily. Also, the nylon cord will not stretch and distort the lace as it dries. Thread the cord through the yarn over holes on the lace points, alternating from front/back on the dry lace points. Secure the cord with a slip knot and launder the lace in 40 C or 100 F water for 15 – 20 minutes. 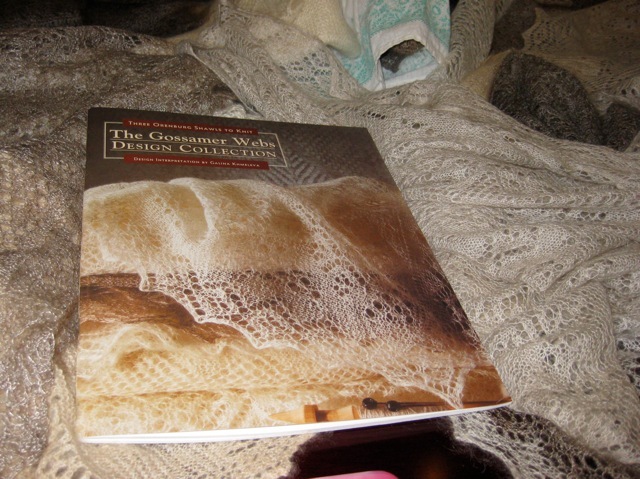 Use a gentle soap like Ivory or Dawn to cut the oil the lace has absorbed from your hands. Rinse well and squeeze out excess water. The item can be blocked on carpeting, a bed or any flat cushioned surface. 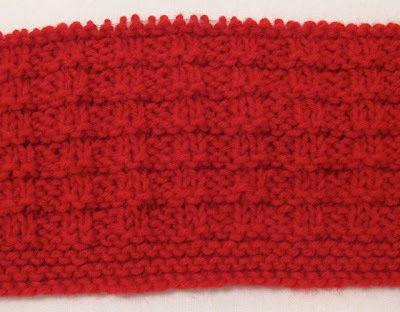 Have a friend hold the cord at top corners and gently stretch the knitting by adjusting the cord corners only. Pin the four corners when the piece is the desired size. Notice the pins are not touching the lace - only the nylon cording. corner pin is moved and adjusted, moving both strands. With the long end of the cord form a square by wrapping cord around corner pins (see photo). Do not cut the cording so you can use it for your next project. Measure the distance between corners to square the item. Adjust pins, if necessary. Pin the cord between the lace points to stretch. (see photo) The pins never touch the lace. Friday evening, I was surrounded by the gorgeous Orenburg lace shawls, pictured above, when Galina A. Khmeleva hosted a trunk show for Fremont County Fiber Guild (FCFG) members. Each shawl was unique and more beautiful than the previous one. 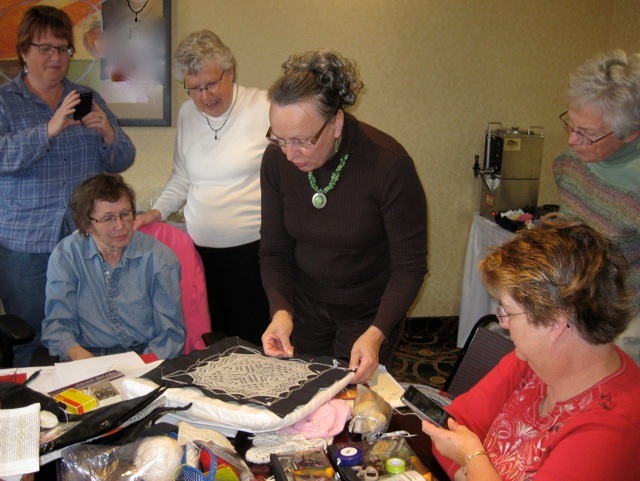 Galina displayed each shawl and allowed FCFG members to admire the intricate stitches on the sheer shawls. 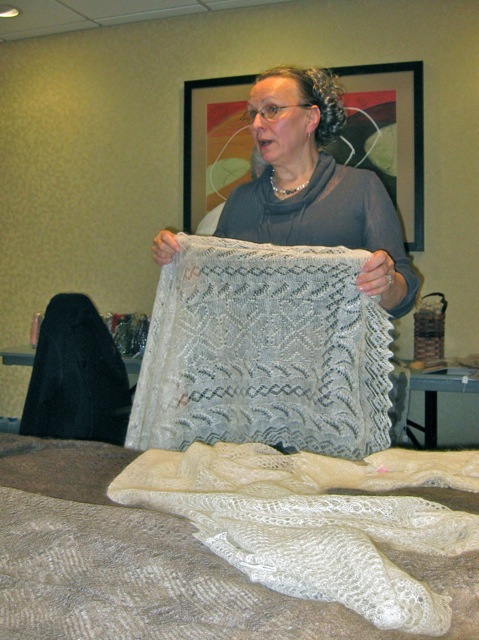 The Fremont County Fiber Guild brought Galina to Riverton for two days of lace knitting workshops, and members could enroll in one day or both days. I decided to take both workshops, each 6 hours long. 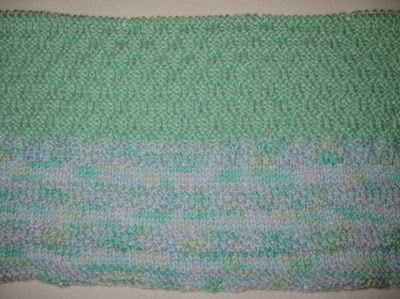 Caron Simply Soft (Soft Green) and Purled Ladder stitch was used for the my section on Some Bunny Loves You. Tuesday, I handed the blanket to Cheryl, the next knitter, and this is Some Bunny Loves You with her section added. She used a stitch pattern called "Boxes and Bells" found in 99 Stitches (Leisure Arts #2973) booklet. 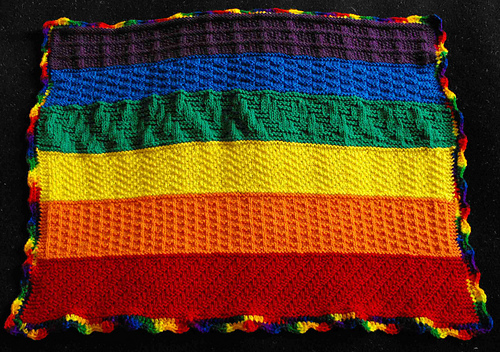 This is going to be a precious blanket! 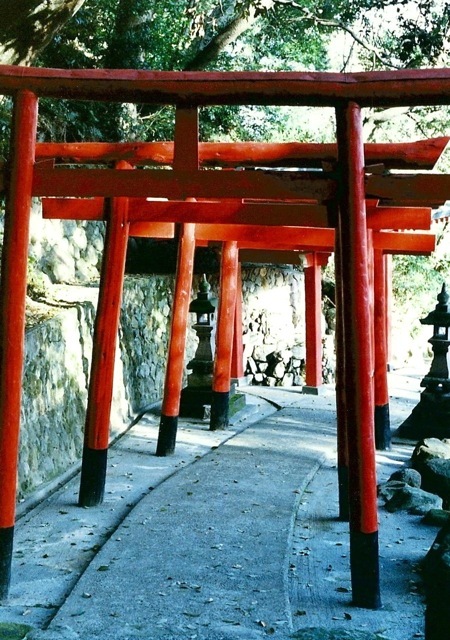 No matter the size of the shrine or its location, the pathway always has at least one torii gate. Usually the gates are painted bright red, but some are rustic like the one pictured above. 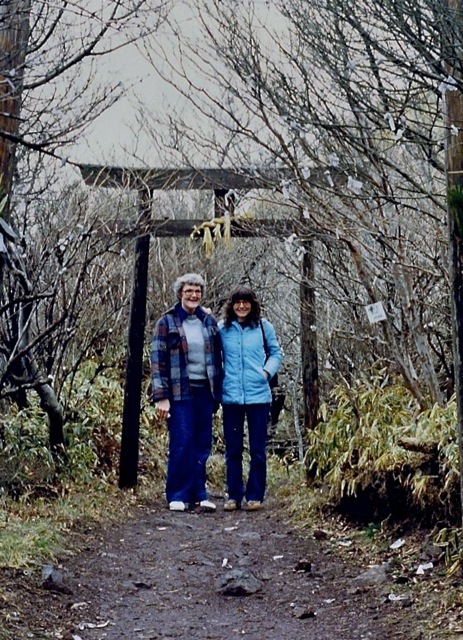 The torii gates symbolize the transition from everyday life into a sacred place: if a shrine has multiple torii, the gates increase the level of holiness for the believer approaching the inner sanctuary. 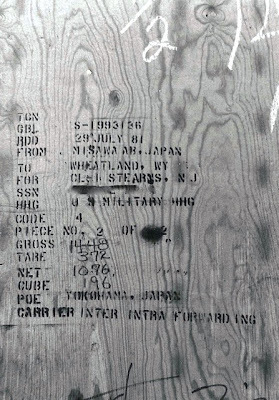 A floating torii can be seen in this previous Foreign Friday post. 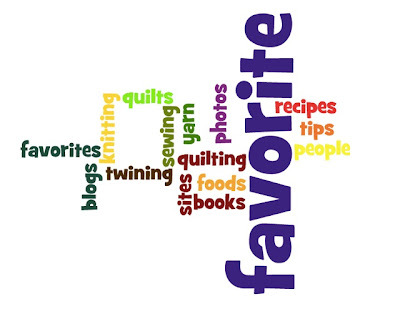 Today, I'd like to share a few favorite knitting sites. 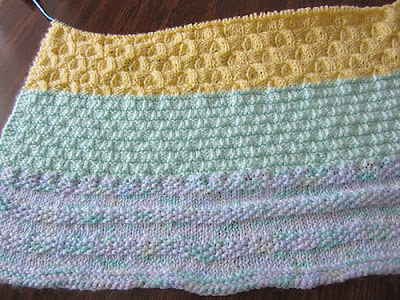 Down Cloverlaine - is a wonderful source of baby bibs and matching facecloths. 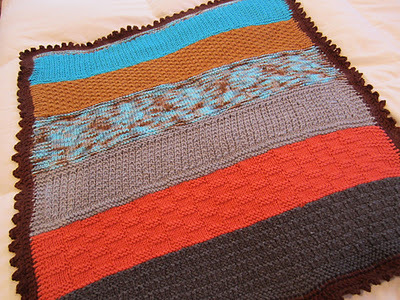 Elaine is a generous designer and offers her wonderful patterns free. 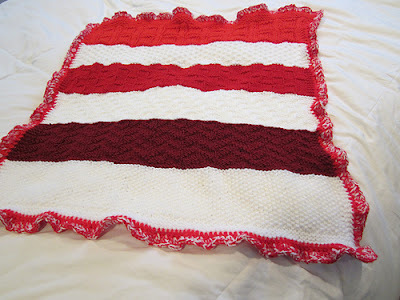 On the right side of her blog, check out the long list of bib and cloth patterns. 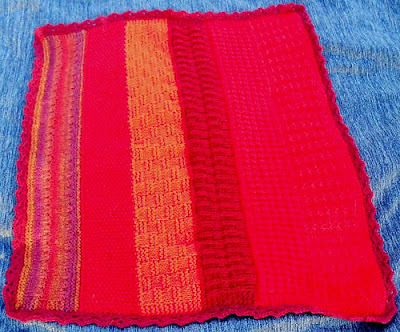 I've knit many Simple Garter Stitch bibs over the years. The posts are here and here. If you need a darling baby gift, I know a bib/washcloth set from one of Elaine's patterns would be a big hit! TECHknitting - this site has more information about knitting than you could ever possibly use. Spend some time browsing the blog to see what I mean. I know you will bookmark it. 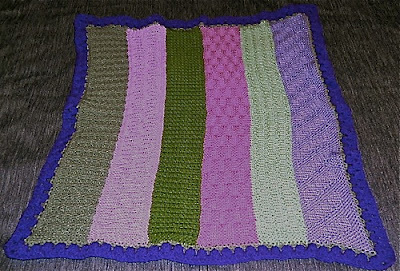 Ravelry - if you haven't joined this site, consider joining. 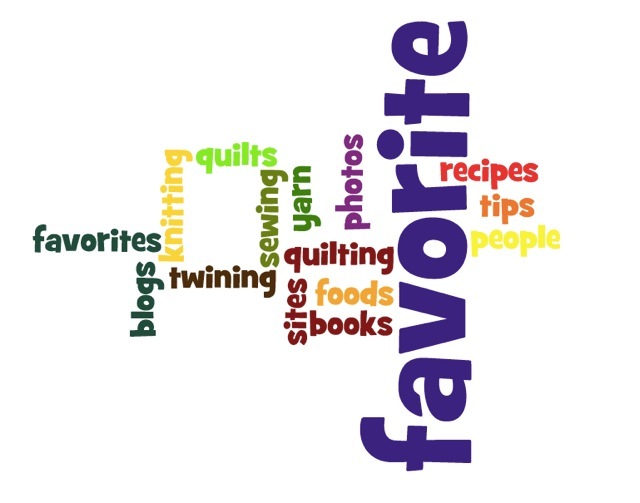 It has more resources that I can even begin to mention: free patterns links, the opportunity to connect with like-minded crafters around the globe, pages to record projects and project notes, a needle inventory (knitting and crochet), etc. 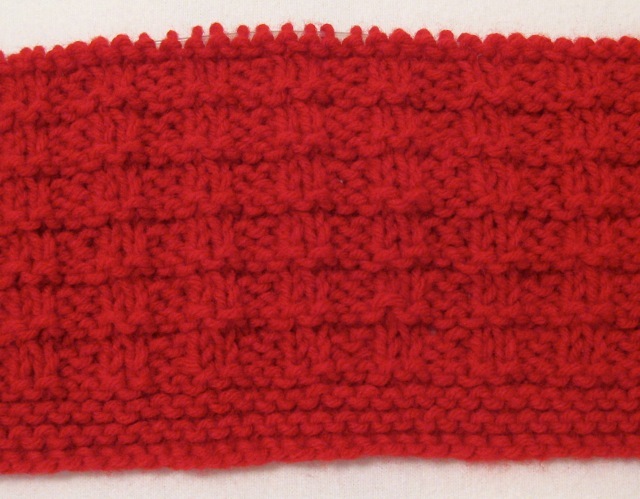 Knitting On the Net - library of knitting stitches and some free patterns. Random Stripe Generator - a fun site for playing with color. Berroco Knitting videos - for viewing old or new to you knitting techniques. Since Mistletoe and Holly was cast off the needles last week, I started Firecracker on the empty needles. 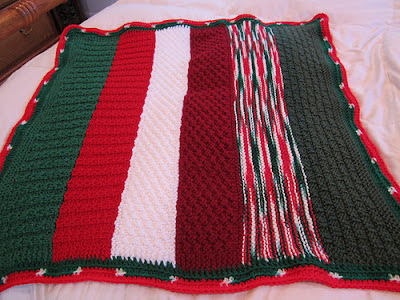 After finishing the Christmas-themed blanket, it seemed appropriate to have a blanket to usher the group into Summer. 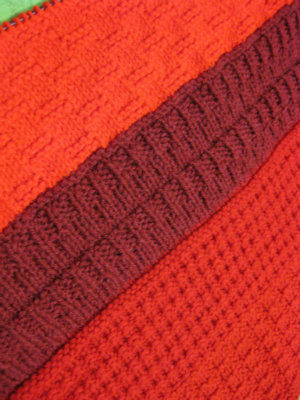 The stitch is Checks and Ridges, a favorite of mine because it is reversible and adds texture. Last week's mail contained a package from FarSide, and inside were three, Quilt of Valor 9-patch blocks. Notice the lovely cards she also included in the package. FarSide is an awesome photographer, and the beautiful, Lady Slipper photos, featured on the cards, are from her camera. 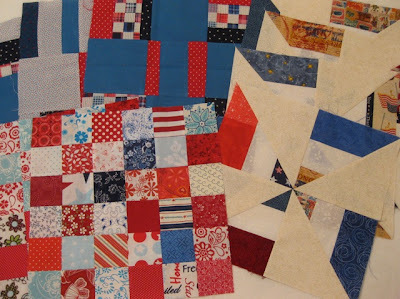 I will use FarSide's blocks with gMarie's extra 36-patch blocks, and several orphan blocks from Controlled Spin to make another Quilt of Valor. 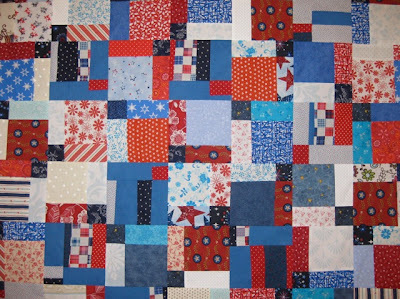 While I haven't decided how to set the blocks into a quilt top, I am toying with some ideas. Thank you, FarSide and gMarie for contributing to my 12 in 2012 Quilt of Valor challenge.